The US-Mexico-Canada trade deal: What’s under the hood? Washington (AFP) – Canada and the United States came in just under the wire late Sunday, announcing a last-minute deal on a revamped trade agreement for North America. The effort rescued a deal that covers Canada, Mexico and the United States — which have a combined annual economic output approaching $25 trillion. 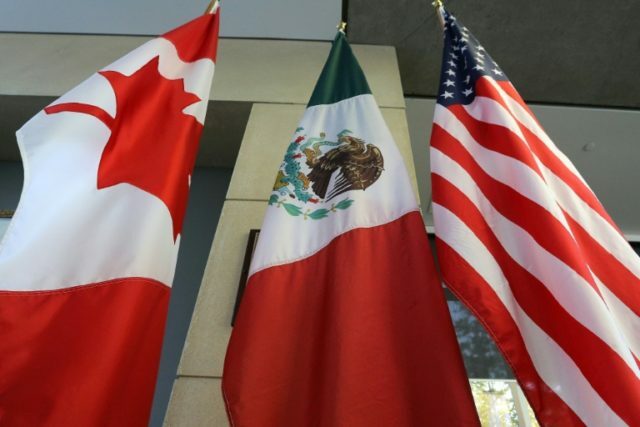 The newly-dubbed United States-Mexico-Canada Agreement, updates the North American Free Trade Agreement, which President Donald Trump had long denounced. Ending NAFTA would have meant tearing up the continent’s closely-integrated auto supply chain. But Ottawa, Mexico City and Washington have now agreed to sweeping changes to manufacturing and labor requirements that US officials say should boost wages and discourage moving production offshore. Most notably: the deal will require that 75 percent of auto content be made in the region, increased from 62.5 percent, and that 40-45 percent be made by workers earning at least $16 an hour. Mexico also agreed to continue to recognize US auto safety standards, unless Mexican regulators conclude they are inferior to their own standards. Trump has threatened to use a national security justification to impose steep tariffs on the hundreds of billions of dollars in autos the United States imports annually. But the USMCA includes side letters that agree to exempt Mexico and Canada up to a threshold of 2.6 million vehicles a year, as well as an unspecified amount of light trucks, and tens of billions of dollars in auto parts. However, the new deal does not resolve the punishing steel and aluminum tariffs imposed worldwide earlier this year, and on Mexico and Canada since May. Canada, which guarantees prices for its dairy producers through its managed supply system, agreed to open its borders a little wider to American milk, cheese, cream, butter and other goods. The concession from Ottawa removed a major sticking point that Trump said was a deal breaker. Canada will also eliminate categories of low-cost dairy goods, and will allow greater imports of US chicken, eggs and turkey. Trump told reporters on Monday he realized Canada could not allow its own dairy producers to be “overrun,” but wanted a better deal for US farmers. The US agreed to Canada’s insistence that the dispute settlement system — formerly known as Chapter 19 — remain in the deal. Canadian officials resolutely rejected Trump’s demand to scrap provisions to resolve disagreements through international arbitration, something Ottawa has successfully used to challenge US tariffs. However, the agreement does make some changes to the more controversial “Investor-State Dispute Settlement” powers, which critics said had allowed powerful companies and wealthy investors to invalidate local laws and court decisions through unaccountable arbitration. The new agreement will require that signatories allow equal copyright treatment for writers, composers and others from member countries, requiring a minimum term of the author’s life plus 70 years for copyrighted works. When NAFTA took effect in 1994, e-commerce hardly existed in its current form and modernizing its provisions was a key premise of the talks. The new agreement prohibits customs duties for digitally distributed goods like software and games, e-books, music and movies. It would also limit local governments’ powers to force companies to disclose propriety source code or place restrictions on where data may be stored. Tucked in the agreement is a provision that appears designed to stop either Ottawa or Mexico City from seeking a better deal with Beijing. If any signatory seeks to enter into a free-trade agreement with a “non-market-economy” — read China — the other parties will then be allowed to cancel the three-country deal announced Monday and replace it with a bilateral agreement. US ties with China have grown increasingly contentious, and Washington has slapped tariffs on more than $250 billion in imports from that country. The new trade pact will remain in force for 16 years, but will be reviewed every six years. If the parties decide to renew the agreement, it will be in effect for another 16 years. But if there is a problem, officials would have 10 years to negotiate to resolve their differences before the treaty would expire. Canadian and Mexican negotiators, as well as US industry, had outright rejected the American demand that any new NAFTA contain a “sunset clause” requiring the parties to re-authorize the agreement every five years. USTR Robert Lighthizer says the labor protections in the deal — which had been part of a side agreement to NAFTA — are the strongest ever negotiated, and are enforceable. Under the agreement, “Mexico commits to specific legislative actions to provide for the effective recognition of the right to collective bargaining,” according to USTR. The agreement also contains far-reaching requirements on internationally recognized labor rights: prohibiting the imports of goods made through forced labor, deterring violence against workers and ensuring protections for migrant workers.